Hi Frank, first THANKS for your theme, I use it on 4 of my DNA color mods (2 Triades, paranormal and therion). I am a total nerd for puff counter, especially on my dna's. It's easy on the non colors. 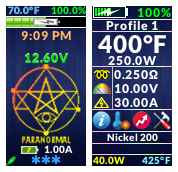 I tried to edit this theme and I successfully changed the bottom left corner of the main screen to show total puffs, the only problem was it only shows when profile is a temp sensing coil, not in wattage or kanthal profiles. I have looked around the theme designer and cannot see how to toggle between conditions for main screen that would indicate temp or non temp sensing. Also I would recommend for next revision putting puff counter in that empty space for the non temp profiles. Thanks! Does your door close with the VTC6? I just got 6 new ones for my old 250 and my new 250c and was sadly met with that fact. Im just curious if this effected all VT6 Triade users? Thanks. Another thing to note, it seems there is a "nick" defect at top of 510 pin, could be described as a pit. Im going to post a photo, hopefully it is visible. For the flash to continue tracking time it would need a battery. Im just talking from a computer perspective (think CMOS battery), so an Evolv expert please do tell. I never noticed this on my therion, but I never take the batteries out and my theme doesn't show the clock. If the clock is dependent on battery, Evolv should have skipped this unless they made it a lipo only feature. Thanks for correction it is .004. Just found something crazy, ran atmoizer analyzer without a tank and got .316! Tapped it with bent paper clip and it dropped to .2 something then eventually went back up! edit: It seems this "memory" of a restance that isnt there in atomizer analyzer can be cleared with hard reboot through escribe. Thanks again. Also should mention I live in Baltimore, incase anyone can recommend local repair or wants to buy. Oh I had remeasure in another theme, so all this does is the one time remeasure? Cool. Also, nice touch would be external temp, not sure if there is room.